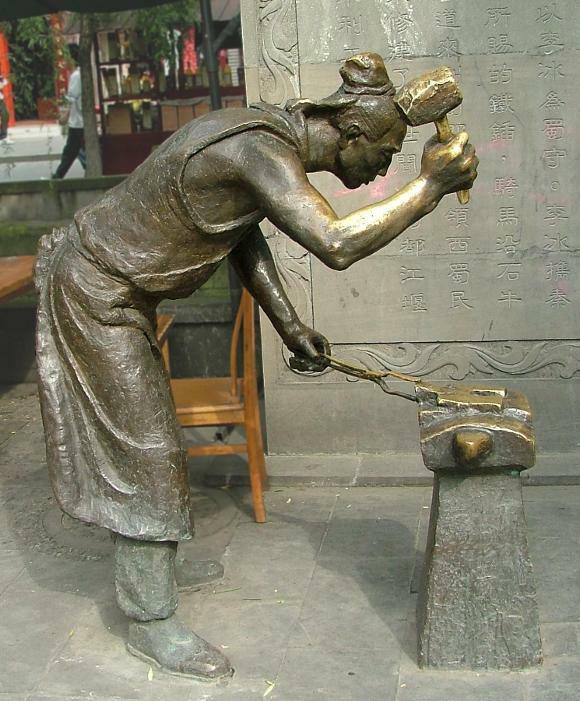 Sculpture of a blacksmith in Dujiangyan. It is to remember the metal workers who made the irrigation project here possible. 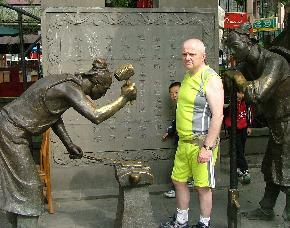 I know he is standing too far from the anvil and his posture is dreadful but I still like the thing. Above Philip Greening-Jackson and his wife Linna with the statue. 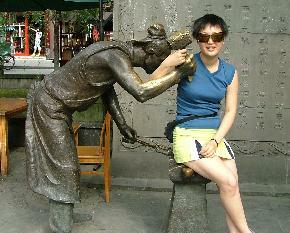 The photos above were sent to me by "Phillip in China" on May 10th, 2008. Three days later the 7.9 earthquake hit the area. Dujiangyan was near the epicenter and completely destroyed. Phillip, Linna and the Statue survived. The perception we all get from the media is that the Sichuan earthquake is a huge, incomprehensibly huge, human tragedy. That is true but underlying that is a whole series of tiny human tragedies each of which is both poignant and touching. Today I was out at one of the tent cities. There I met a couple who had lost their home, their livelihood and pretty well everything except the clothes on their backs. What upset them? I had my dog with me. Theirs had been killed in the quake. That moved them to tears when all the greater losses had been simply shrugged off. The story that touched me most was one that happened a week or so ago. One of my friends here is an American. His wife gave birth to a baby boy just about a month before the quake. One of the nurses, her English name is Nicole, came to the house to let them know how to get a birth certificate for the baby. It is a necessity should they need to leave the country. Despite everything (this was a week after the main quake) Nicole had taken the trouble to find my friends and try to help them. My wife, Linna, and I spoke to Nicole. She relaxed a bit and we offered her luncheon. She was pleased to share with us and proceeded to eat like a wolf despite her diminutive size. She explained that for the week after the shake she had been existing on rice gruel from the canteen as she couldn’t leave the immediate vicinity of the hospital. In fact the visit to us had been her first break. She had lost everything in the quake and had only the clothes in which she stood and her bicycle! We were able to find her some clothes to take with her. We asked her if there was anything else she would like. She was embarrassed at first but then admitted there was something but she was ashamed to ask. We finally got out of her that what she wanted and needed most in the world was a plastic washing up bowl so she could wash her long hair. She strapped everything to her bicycle and my last image of her was her pedaling away with a pink plastic bowl tied to her back. Yes even a plastic bowl can make some people happy. Nicole considered herself to be lucky. One hospital in town was completely demolished. Had she been working there she would almost certainly have been killed. As it was she, and other nurses, had to go into unsafe crumbling buildings and literally carry patients down stairs and get them out of danger. After doing this for several hours they were exhausted. She was sent to the school, just over the road from her hospital, in order to help as children were dug out of the rubble by the Chinese army. She did what she could and saved many. Her co-workers did the same. One of the girls, with whom Nicole worked, took a few minutes to go home. She had her life savings in her apartment. It amounted to less than US$200. She had been working next to Nicole all day in crumbling masonry. Whilst she was in the apartment block an aftershock destroyed it. She was killed outright. For less than many of us would spend on an evening out. This is not semi religious internet schmultz. I can show you the nurse, she can probably show you the washing up bowl! These are real stories about real people who are living and dying right here right now. Disaster appeals suggested, Chabad Hong Kong or Chabad Shanghai.